In order to speed things up with building admin sections under System > Configuration area in Magento I wrote a little blank extension. Hopefully its a step or two beyond “Hello world” level. I named the extension “CoolDash”, short from CoolDashboard. Name holds no special meaning, just something I popped out of my head. First thing you might notice when you open config.xmls and system.xml is the attribute naming. I intentionally used names like “somecooldashmodel2”. I found it extremely difficult, error prone and annoying to get around in scenarios where different areas of config files use same names for attributes with different meaning, like “customer”, “catalog” and so on. Hopefully my “funny” naming scheme in config files will give you a better overview on where everything goes. Below are few screenshots to see the result. 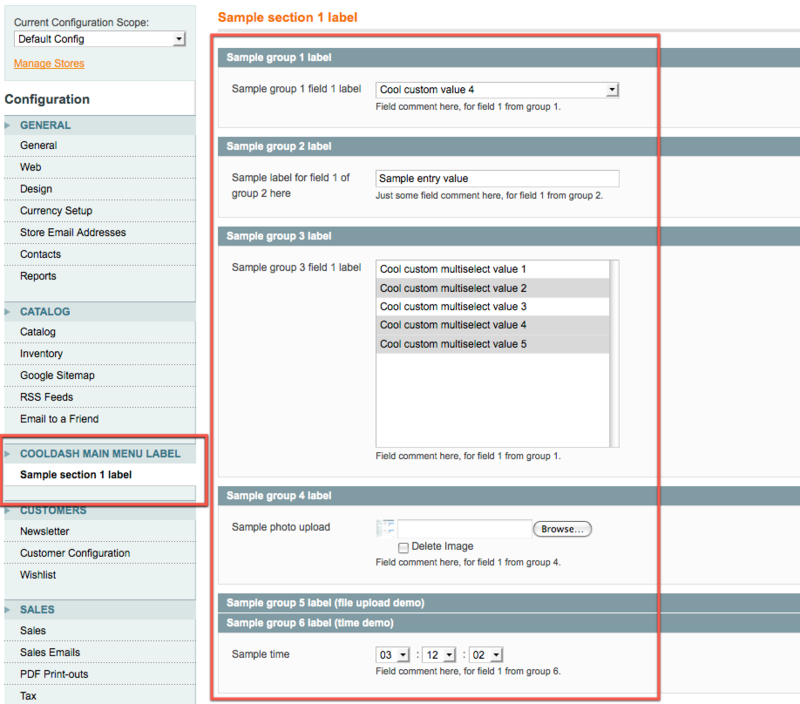 Download ActiveCodeline_CoolDash.Blank extension for building “System > Configuration” area of Magento admin interface. Although built on Magento 1.4alpha, should work on Magento 1.3. I got it work on magento 1.6.1 but don’t know why the layout display right but don’t see the main content. Any idea why? Guys, any idea how to get the new 1.4 TinyMCE editor to show on text areas in custom modules like this? I have an error saying “Access Denied” when I clicked on the Sample Section label. I’m using magento version 1.4, i tried to logout and log back but i have always the same error. Do you have a version of this that works on Magento ver. 1.6.0.0?? I have tried it and I keep getting Access denied; even if I log out and back in. Could you explain how to store datas and/or execute such a piece of code by pressing a button. In fact in one of a group, I’d like to generate an xml file when pressing a “generate” button. This is a amazing. I have to say, I have created a dummy module to use whenever I need to create a new module. But I did not know how to setup a module to be able to view configuration on the admin side. This is great. Please see my latest article (wrote it last night) http://ajzele.net/color-switcher-improved-for-magento-part-1. It adds extra field to Image tab as you pointed out. If you get “Access Denied” using CoolDash, logout of Magento then log back in and try again. Hi thank you for the sample. Any ideas guys on how to fix this one? Thanks in advance. Thanks again for another helpful tool. It seems to work good, Thank you for this help! Could you explain how to store datas and/or execute such a piece of code by pressing a button. In fact in one of a group, I’d like to generate an csv file when pressing a “generate” button.